September 9, 2014 - The Bethlehem Police Department continues to investigate the crash of a Cessna 172 Skyhawk airplane (N79438) that occurred on the CSX Railroad property in Selkirk on Monday. At approximately 4:50pm, the Bethlehem Police Department received several calls reporting the plane crash. The investigation has determined that the single engine Cessna plane had just taken off from the South Albany Airport prior to crashing into a car hauler rail train car at CSX Railroad. Both occupants of the plane are deceased. The pilot, has been identified as Nancy B. Gertzberg, 61, of Petersburh, New York. The co-pilot and flight instructor has been identified as Allan B. Richter, 48, of Delmar, New York. Richter was pronounced dead at the scene and Gertzberg died on the way to Albany Medical Center Hospital. 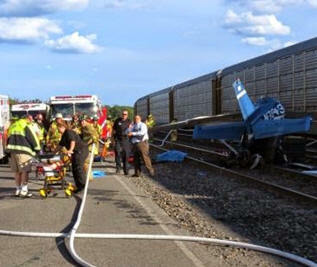 The pilot did not contact air traffic control to report any problems. Detective Sgt. Adam Hornick said "We don't believe they had any communications from the airport, they had just taken off." A LifeNet helicopter located at the airport was the first on the scene. Hornick reported "They could see it crashing and hear it." Selkirk Fire Chief Bill Asprion said "Our immediate concern was, after we saw the plane had hit the side of the train, was a fuel spill. There was approximately 60 gallons of fuel on the plane. Our main goal was to work on the rescue of the victims, so we probably put people in harms way a little bit because of the fuel leak." Things could have been much worse, had the plane stayed in flight a few seconds longer it would have hit the middle of the raid yard striking rail cars contain Bakken crude oil which would have been catastrophic. Gertzberg had a sport pilot license and was planning to go out into the practice area to work on aircraft maneuvers for her upcoming practical test to become a private pilot. A witness, who was outside the airport office, saw the airplane take off from runway 19, and after it reached an altitude of about 100 feet, the engine quit. A few seconds later, the witness thought he heard the engine restart, then he heard a loud bang. Another witness was standing by his parked airplane about ¾ of the way down the runway. According to the witness, the airplane took off "normally" just past where the witness was standing, and when it had climbed to about 100 feet, the engine completely lost power. The airplane leveled, the engine started again, and the airplane continued a climb past the end of the runway. The engine then began to run "rough," and the airplane banked to the right. As it continued banking, the engine "lost most of its power," and the airplane descended while still in a bank. The airplane then disappeared below a tree line, and the witness heard a single, loud bang.